When we were at the dog track this past weekend, we found several ladders inside the building. They didn’t look to be that old, and it didn’t dawn on me why they might be there until my husband saw the photos that evening, and he ventured a guess–copper wiring in the light fixtures. I’m not sure why there was a reservation booth at the dog track, and I’m also not sure why there’s a big furniture sign there, unless they held a fixtures sale when the place closed. Put all these elements together, and you get more questions than answers, but it makes a pretty good HDR image. HDR created from seven bracketed photos processed in Photomatix v4. Post-processing in Paintshop Photo Pro X3, using Topaz Adjust / DeNoise. Normally I tend to increase the color saturation on my HDR shots, but in this case I actually reduced the saturation. I think the more subtle tones are more in keeping with the character of the place–bleak and desolate. If you’re interested, I came across this video on YouTube that someone made while walking through the site. It was uploaded to YouTube in January of this year, so it’s pretty close to what we saw when we were there. It will give you a good idea of the sounds we heard–wind blowing, tile and glass crunching underfoot. Check it out! 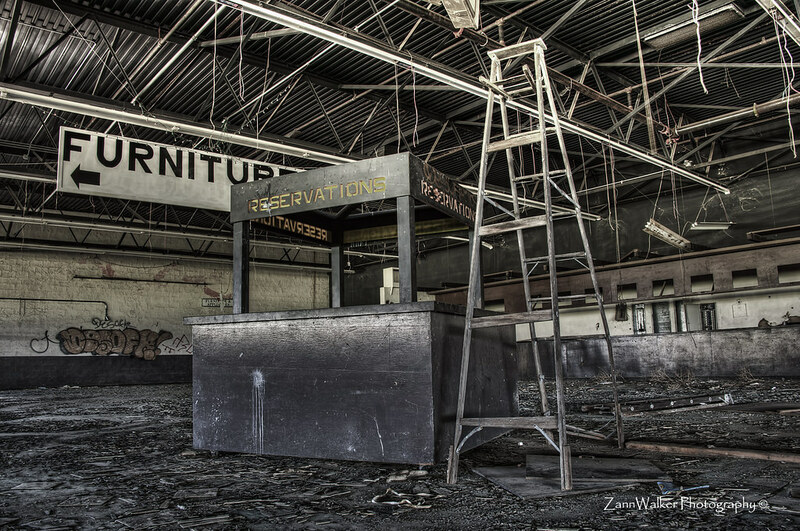 This entry was posted in Information, Processing, Shooting and tagged abandoned, architecture, Arizona, AZ, Black Canyon, building, camera, D700, furniture, greyhound, HDR, ladder, Nikon, Paint Shop Pro, park, photography, Photomatix, racetrack, reservation, software, Topaz, video. Bookmark the permalink. Sweet shot, love that place! Thanks for sharing your images from the dog track. I really enjoyed shooting there and am enjoying your images from your visit.